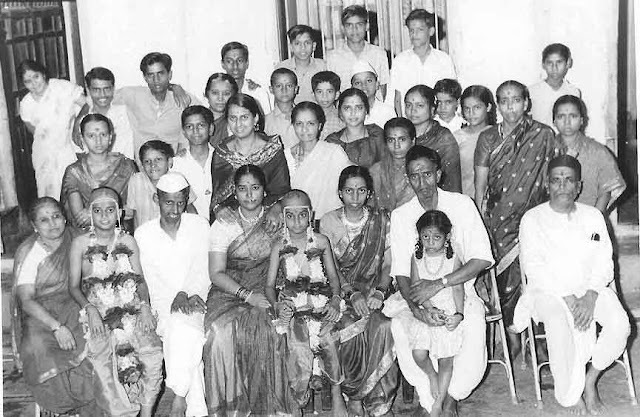 An extended family consisting of three generations shortly after arriving in the UK in the early 1980s. Even within family life, there was a degree of segregation, to help avoid over familiarity. 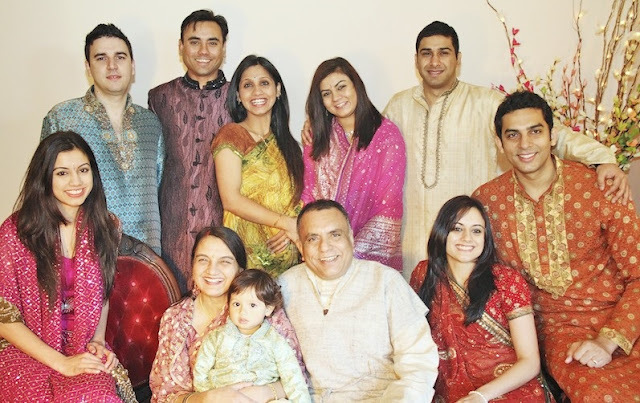 Hindu attitudes towards family life can appear ambivalent. Some texts condemn it as "a deep dark well," in which one loses all sense of spiritual direction and becomes hopelessly entrapped in maya (illusion) .These texts are especially favoured by ascetic traditions. Other scriptural passages glorify responsible family life as the backbone of varnashrama-dharma society. Ideologically, these two poles are reconciled within the notion of the grihasta (household) ashram, based on the principle that material facilities can be utilised to cultivate spirituality and detachment. Many popular traditions hold that the spiritual merit attained within sannyasa can also be achieved by properly executing household duties. 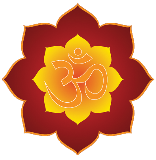 The basic building block of Hindu society is the joint or extended family, usually consisting of three of four generations living together. The women collectively cook and share domestic responsibilities, and the men provide the pooled income. Elders take important decisions and, based on their own experience in life, offer guidance to younger members. Within the family, property usually passes from father to son, and men make many of the decisions, though older ladies carry considerable influence. When women marry, they usually join their husband's family, though maintaining contact with their own. Hindu families demonstrate firm ties of affection, strikingly different from many Western families. Hindu scripture has elaborately defined the dynamics of the various relationships within families. For example, a grandchild can tease and joke with a grandparent in a familiar way, not permissible with the father or mother. The different relatives are given specific terms of address, unlike the west where "aunt" or "uncle" refers to a whole host of relatives and family friends (see below). The extended family traditionally provides shelter and support for the elderly, the disabled and the less well off. Children are expected to repay the debt owed to their parents by supporting them in their retirement and old age. An important aspect of Hindu family life is the inter-dependence between members. Marriage itself is a broad social and religious obligation, rather than just a relationship between partners. The extended family provides considerable practical and emotional support, as for example when children are born. One advantage is that marriage stability is not inordinately reliant on the state of the couple's emotional ties. Despite these possible benefits, social trends indicate that the extended family is becoming less popular, especially outside India.Young couples often value the freedom that the nuclear family offers. They are also adopting other aspects of the Western lifestyle. TV is becoming more popular than worship, and is certainly strongly influencing family values. Why Do We Put Turmeric paste (Haldi) Before Marriage? Love or affection - How can you tell? Dress code is important in some temples? why God allows pain and Sufferings? God doesn't exist? What is a goal of life? Have something to add to this story? Share Your Comments on this Post and Question us..